Thanks for M. Brooks for the best pencils ever! 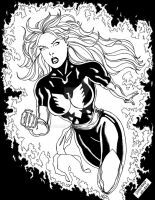 Here she comes, The Ultimate Phoenix, Jean Grey! I loved this character a lot, and now, when the series ended I'm scared enough. As you know, many mutants from Xavier's School are dead now, but Jean is not. I'm just hoping this character will be okay. This is really amazing!!! I love the use of the colours, and the fire-effects and such, and does look very well down and exactly as I pictured Jean Grey God Bless you for such a wonderful deviation! Hope you go very far in life with your talent! Awesome rendition of Ultimate Jean. Hallo! I'm helping with her article.Your art was featured here [link] Plz, fav it, so more ppl will see it! She looks... scary this is the real Jean, yay!